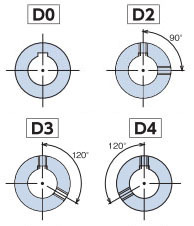 Simple torque adjustment: Torque can be simply adjusted by just matching nut heights. Short delivery for bore finishing: Products with standard bore finishing can be delivered quickly. It will automatically reengage after the cause of the overload has been removed by just turning the drive side. Single position type: The ball and pocket arrangement, which are the torque transmission elements, can only be engaged in one place for a unique combination. Little vibration after sprocket and pulley installation. Our selection calculator will select the right Shock Guard from Tsubaki's entire Shock Guard series to match your usage conditions.